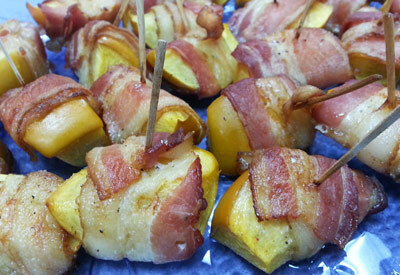 Wrap a piece of bacon around each persimmon wedge; secure with a toothpick, and arrange on parchment-lined baking sheets. Roast for 20 minutes. Flip the wedges, rotate the pans and increase the heat to 425 degrees F; roast until the bacon is crisp, about 20 minutes. Brush with vinegar and season with salt and pepper. Serve immediately.